It may seem hard to believe as we head into spring, and you’ve been struggling to find ways to keep warm, that it won’t be long and you’ll be looking for a way to cool off. When July and August roll around and the temperatures climb into the 80s, 90s and above, there’s no better way to beat the heat than at one of America’s great water parks. But you don’t want to make your trip any more work than it needs to be. You don’t want to have your head buried in a map or your GPS, have to fight traffic or look for a parking place. And when the day’s done at the water park, you’ll be exhausted. You don’t really want to have to get behind the wheel of your car and try to drive home, do you? There’s a better way to enjoy one of America’s new summer pastimes. 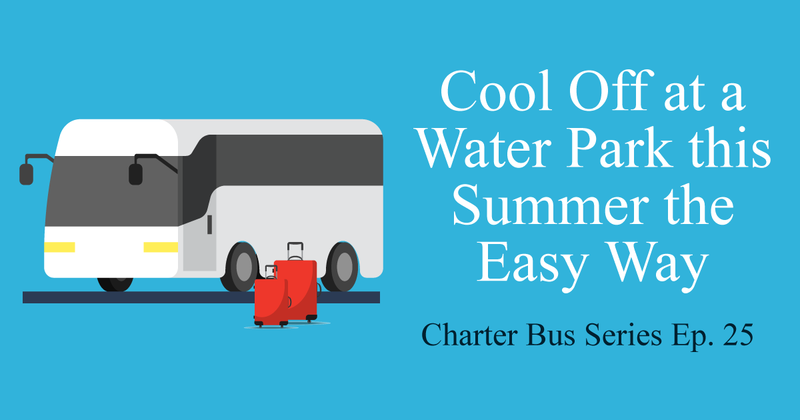 Travel to and from the water park in the comfort and convenience of a charter bus from Kevin Smith Transportation Group. Relax with friends and family while we handle all the details. The name is appropriate as this park spans 64 acres just outside of the metropolitan Denver area and offers nearly 50 different attractions. For the not so faint of heart, there’s the Mile High Flyer, a high-speed water coaster. The Storm replicates all the noise and fireworks of a real thunderstorm. This family friendly park in Virginia is consistently considered one of the cleanest and most well maintained water parks in the nation. It’s newest attraction, the Colossal Curl, hurtles you through a 24 foot tunnel into 40 foot breakers!! There’s also Aquazoid, where you’ll drop 850 feet before you get drenched by hidden waterfalls. With 51 water slides, two wave pools and even a surf simulator, this is the largest water park in America. It’s extremely popular with the daredevil crowd, with Scorpion’s Tail, a near vertical slide; and the Black Anaconda, a water coaster that can hit 30 miles per hour. Imagine falling 15 stories on a water slide, reaching speeds of up to 70 miles per hour. That’s what you’ll experience on Verruckt (German for “crazy”), the tallest water slide in the world. Schlitterbahn is also home to the largest tidal wave river on the planet. Though it’s smaller than some of the other parks, White Water Park is extremely well-organized and offers a wide array of family-oriented attractions. The KaPau Plummet is a drop-floor slide that can send you careening around a 70 degree hairpin turn. Families tend to hang out at Splashaway Cay, with elevated walkways and slides for children of all ages (including adults!). It’s separate from the theme parked based on the childhood of famed singer Dolly Parton, but it’s every bit worth the visit. You can hurtle down the river in a white water raft on the Big Bear Plunge or free-fall 70 feet at Fire Towel Falls. There’s also RiverRush, Tennessee’s only water coaster. About a half an hour east of Los Angeles and just north of Pomona, this park is a haven for the fearless. Fall into the Dark Hole on a two-seat raft, where you’ll drop 52 feet straight down. Take a ride on the Bermuda Triangle, at speeds of up to 50 miles per hour one of the faster slides in the country. Or catch a wave in the park’s million gallon wave pool. It’s Hawaii, so you’ll have the tropical landscape all around you, including majestic cliffs near the park. There are great beaches, but there’s also a 400,000 gallon wave pool and “Da’ Flowrider,” a surf simulator. True to its name, this park offers access to marine animals as well as great rides. The Breakaway Falls is the tallest, steepest and only multi-drop water slide in Orlando. Visitors can also interact with sea creatures at the Dolphin Plunge. In this town, it’s Christmas all year round, and this park may be the biggest present under the tree. It features three world-class water coasters, the Mammoth, the Wildebeest and the new $22 million dollar Thunderbird. Whether you’re heading to a water park for the day or planning to spend a few days, it can be a hassle when you have to take care of all the details of getting there and back. You’ll have a much better time if you leave everything to us. No worries about traffic or parking or finding your car at the end of the day. Make it a real vacation with a charter bus from Kevin Smith Transportation Group. When it comes to group travel, there’s no better way to go than on a charter bus. Consider these great reasons for renting a charter bus from KSTG. It’s the safest way you’ll find to travel—We hire the best drivers and ensure that they get regular training, so that they are ready to respond to any situation. In addition, because of the limited access to our coaches, you won’t have to worry about your personal safety or the security of your personal belongings, either. You’ll always be able to customize your trip—With a charter bus, every trip is a little bit different, designed to meet the unique needs of every group. You tell us when and where you want to go and how long you want to stay there, and we’ll handle everything else. Because of our access to a large fleet of vehicles, last minute changes and even last-minute bookings are usually no problem. A charter bus is the purest form of vacation—With a charter bus, there’s really nothing you have to do, except show up and have a good time. No worries about schedules or directions or what time it might be. We’ll get you where you need to be when you need to be there. You can depend on a charter bus—Because our charter buses are regularly maintained, mechanical problems are rare. Furthermore, with our state-of-the-art navigation and communication systems, we can anticipate traffic issues and find alternate routes to get you where you there on time. You won’t feel like a pretzel in your seat—All of our coaches have plenty of room between the seats, and there’s ample space in the aisles, too. And we’ll never chastise you for moving about in the cabin. Charter offers the best deal for a group—Charter bus travel is consistently the most affordable way to take a group of people to one of the country’s water parks. And because you’ll save so much money, you can bring back mementos of your trip. Charter buses are good for the environment—Instead of taking a bunch of cars, you’ll have a group in a single vehicle, so you’ll leave less of a carbon footprint.